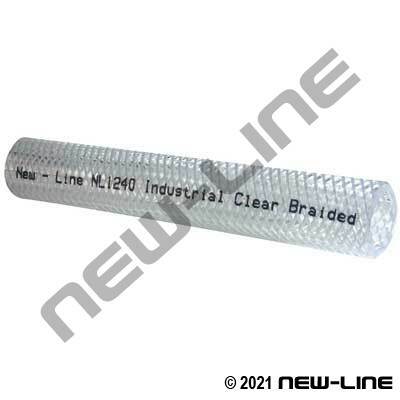 NL1240 is a traditional, price sensitive, clear braided PVC hose used for a variety of light duty air, non-potable water, diluted chemicals, or other non-critical applications across various industries. NL1240 is NOT for use in food grade applications, potable water, or critical plumbing applications (for food grade applications, see our NL1270 as it is made of high purity compounds and will not impart taste or transmit odour). For higher pressure ratings and a greater size range also refer to our NL1270 series. Construction: Tube: Smooth, clear PVC. Cover: Smooth, clear PVC. Reinforcement: Textile cords.